Hold the gluten, grab your apron and start your ovens! Betty Crocker is hosting its first-ever gluten-free recipe contest, the Baker´s Challenge Gluten Free Recipe Contest, and we want you to be a part of it! We know baking in a gluten-free world poses its own challenges - as well as sweet rewards - so we want to give you a chance to show off the creative solutions and tasty treats that you´ve created for your family and friends. Recipes will be judged on five key categories: taste, creativity, ease of preparation, consumer appeal and appearance. 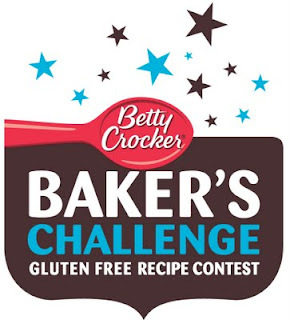 Plus, we want you to keep baking deliciously, so if you´re one of 10 selected finalists, you will receive a Betty Crocker Gluten Free Baking gift basket filled with baking items and Betty Crocker Gluten Free mixes. Even more exciting, finalists´ recipes will be featured on www.glutenfreely.com/bakerschallenge and voted on by the Gluten Freely community to determine the Grand Prize Winner! For great recipe tips, ideas, and suggestions, visit www.glutenfreely.com to help get you started and learn more about the Baker´s Challenge Gluten Free Recipe Contest. 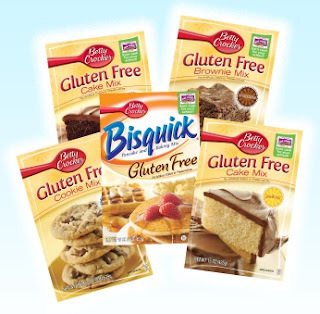 In addition, through the end of June, you can save 20% on the purchase of any of the five Betty Crocker Gluten Free mixes. Visit www.glutenfreely.com/ourstore to buy yours today! Hey guys cool info - huh? Also I'm giving away a prize package to go with this! One winner will win all the gluten free mixes shown above! Bisquick, Cookie Mix, Brownies, Yellow Cake, Devils Food Cake. I already made the brownies and they were delicious! Mandatory Entry: Tell me which of the above mixes is your favorite! Or which one you would like to try most. RULES: Giveaway is open to US Residents only. Giveaway ends June 29, 2011 11:59 PM EST. Winner(s) will be chosen via Random.org. Must have valid email in blog profile or leave email in comments otherwise you will be disqualified. Winner(s) will have 48 hrs. to confirm by email, If no confirmation in that time frame a new winner(s) will be chosen. Disclaimer: The product and giveaway were provided to me from Betty Crocker through MyBlogSpark. I would like to try their Cookie Mix. I use Bisquick more than anything so I would try that! Oops, forgot to sign out of an old email, so it's my old profile, but you know who I am! I most want to try the brownie mix! I'd like to try the Devil's Food Cake Mix. The brownie mix is my favorite, and I most want to try the chocolate-chip cookie mix. I think I'd like the Brownies the most. I'd love to try the Devils Food Cake mix. I'd love to try the Devils Food mix. The cookie mix would be my fav. I would love to try the Gluten Free Brownie Mix. I am a Facebook friend as Jill Myrick. I am following via Networked Blogs as Jill Myrick #2. I'd like to try the Devils' food mix. I would like to try the Betty Crocker Gluten Free Brownie Mix first! I'm most excited to try the Brownie mix. Thank you for the lovely giveaway.